The Palmer Group » 13 Essential Steps To Follow When Hiring A Contractor. 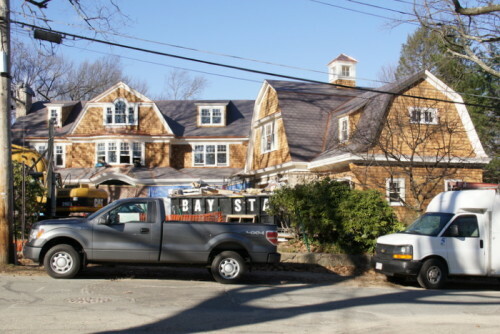 New Construction Project in Newton MA. When you can, get a referral from someone you trust. Check references. If possible, see jobs the contractor has completed. Ask your town’s building department to see if they know of your contractor and ask about their reputation. They will let you know If there are any red flags. Lastly, check with the Better Business Bureau or the local Chamber of Commerce for complaints against the contractor. Get at least three written estimates on any job. We do not always choose the lowest; we choose the contractor we trust the most to get the job done correctly. Be sure to get a written contract that explicitly states the scope of the work to be done. You will also want to know how changes to the contract will be handled if the need arises. Ask if the contractor’s workers will do the entire job or whether subcontractors will be involved. If subcontractors are involved, you will want to confirm that they are licensed and insured. If the contractor asks for a down payment, make as small of a down payment as possible. This will help prevent you from losing money if you have any issues with the contractor or they fail to complete the job. Confirm that the contract includes a timeframe for when the work will be completed and what recourse you have if it isn’t done on time. Know that in many instances you can cancel a contract within three business days of signing it. Be sure that the contract specifies that any damage or clean up after the job is the responsibility of the contractor. Have the contractor pull the necessary permits and any licenses needed to complete the work. Some contractors will tell you permits are not necessary because they complicate their job. Check with the town building department to verify if they want permits for work being done. Without permits, you are at risk when you go to resell the home. Buyers will not know if appropriate steps were taken to ensure that the work was done correctly and up to code. Request that the contractor to indemnify you if work does not meet local building codes or regulations. Ask for written proof of insurance. Research and understand materials that will be used on the job; make sure that they meet your specifications and expectations. Don’t make any final payments until the work is complete, the job site is clean, and you’re satisfied with the work. Critical Steps You Should Do Before Listing Your Home For Sale. BELOW IS A LIST OF ALL NEW CONSTRUCTION HOMES AVAILABLE IN NEWTON. LET US KNOW IF YOU HAVE ANY QUESTIONS ABOUT THESE HOMES.